Sweet Orphan Annie 2006-2007 - On June 30, 2007 during the Canada Day celebrations and Orono's 175 year village recognition day, a horrible tragedy took place at the Trillium Morgan Horse Farm. Our daily farm chore and lesson program was conducted as usual. Horses were turned out so chores could be done; lessons progressed in the arena as scheduled. Fortunately, I had just finished my last lesson of the day when an CF 18 fighter jet arrived, swooping down with great speed above the tree-line at an elevation of 500 feet and directly over our west pasture before passing over the main arena roof. I managed to get the student off her horse safely and put the horse in a stall still with its tack on. A client was ground driving her Morgan mare at the time and managed to control her without injury. Those few remaining horses that were in the stable at the time of the flyby were frantic in their stalls, some receiving minor cuts and bruises. The remaining 30 horses on our farm were out on pasture in different turnouts; one to the north, another to the south and east. It appears that Annie, who suffered the mortal injury was trying to clear the fence and got entangled in it. With each pass of the jet, she would struggle to free herself cutting her hind leg so severely that it sliced through two tendons and through bone entering into marrow. This devastating injury rendered her hind limb useless. She was humanely destroyed. The older mare caught her left front hoof in the page wire and in her panic, cut to the bone severing an artery. She remains in critical condition. Several other horses had less grievous injuries that could be treated without major intervention. A dozen people came to our aid. Four men struggled to support Annie as she awkwardly made her way into the stable. The older mare walked slowly under her own steam to the stable. The veterinarian was summoned immediately as we applied first aid treatment to the horses. I personally took over monitoring vitals signs and organized a temporary sling to help support the injured horses that had lost life-threatening amounts of blood. Pressure bandages were applied time and time again to help control the bleeding. When the bleeding was somewhat controlled, we irrigated the wounds and dressed them until the veterinarian arrived. With the horses succumbing to shock and the injuries so severe, we called in a second veterinarian to assist. Drs. Cox and Morrison worked feverously on the two most seriously injured animals. In the end, Annie was euthanized. Her owner was unable to assist the veterinarian with this task, so I took over this very sad duty. We were able to document both the injuries and position of the jet. A client, who was videotaping his daughter at the time, turned his camera to the sky and caught the jet on film flying over the pasture and arena. Another client had a friend with her who is a professional photographer. She took the graphic pictures of the injuries before treatment. It was a horrific day for us at the farm that has left us all numb with disbelief. 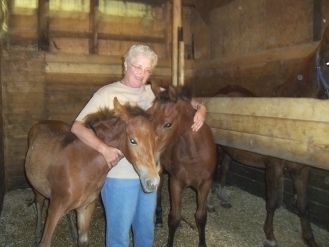 It has been especially hard on the children who worked with these horses and loved them. Other Trillium Horse we honour by remembering them!